When President George Washington and his family inhabited the Deshler-Morris House in the 1790s, they brought along a 23-person entourage that was in charge of making sure the household ran efficiently. This support system consisted of an array of paid and unpaid individuals, such as accountants, domestic servants and African slaves, who played an integral role in creating the history that is told there today. After a yearlong shutdown, the newly named Germantown “White House,” which is located at 5442 Germantown Ave., will reopen to the public in April 2011 after a $4.8 million renovation project that funded updated utilities, a geo-thermal heating and cooling system, and an interactive exhibit spotlighting the lives of these lesser-known individuals. 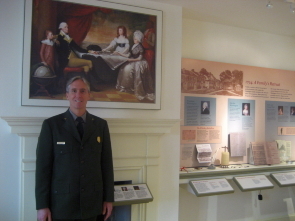 Chief Officer Stephen Sitarski of the National Park Service said that relaying these other stories will not only provide viewers with a more powerful link to an iconic personage, but may also engage Germantown’s sizable black population by telling stories that will appeal to a wider audience. “It’s common to hear from African-Americans that knew the site was famous but never felt connected or welcome. A part of that is simply because they weren’t included in the story,” says Sitarski. The tour begins next door in the Bringhurst House, where guests can browse a new gallery adorned with photographs, timelines and pictorial storyboards that trace Germantown’s progression from a wealthy suburban area in the 18th century to the diverse, working class neighborhood that it is today. Also highlighted is a detailed sequence of the Battle of Germantown in 1777 and information regarding the yellow fever epidemic that plagued Philadelphians in 1793. 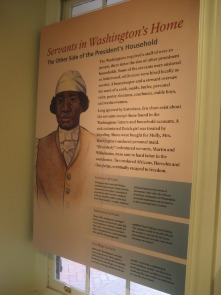 Another area of the room is dedicated to the people who inhabited the house, including two servants, Hercules and Oney Judge, who are singled out because of their successful efforts to seize freedom. Visualizations of their time with the Washington family can be found in the large kitchen where Hercules prepared the family’s meals and the room in which Oney slept while tending to Washington’s granddaughter, Nelly. The 10 other rooms open to visitors include the First Lady's tea room, a cozy family parlor and the space where the president ruminated over foreign and domestic affairs with distinguished cabinet members like Thomas Jefferson and Alexander Hamilton. While all of the furniture is a replica of what was actually used in the house, Sitarski says the footprint is much the same. “The home is considered by historic architects to be one of the most intact 18th century homes in America.” He added that “75 percent of it is original.” This is due to the immaculate upkeep of the Deshlers, who kept the house in their family for 130 years. Germantown Historical Society Director Laura E. Beardsley believes the changes will make a positive connection with the community. "I think anything that broadens Germantown's experience of its history and opens discussions about enslaved African Americans of the time will have an impact. It's important to develop programs for a wide range of audiences. The Germantown White House is a story not successfully told to the Germantown community and the National Park Service should be commended for sharing a more enriched perspective." Sitarski is optimistic that the new format will present a more accurate telling of Germantown’s remarkable historic roots. "When visitors come through the house, we want them to experience the accounts and examine the viewpoints of the people who lived here. Our primary mission is to save and preserve these stories so we can share them with the public." This article was written and reported by Josh Middletown and Megan Frankowski for Philadelphia Neighborhoods, a publication of Temple University's Multimedia Urban Reporting Lab, and originally published on February 3, 2010. 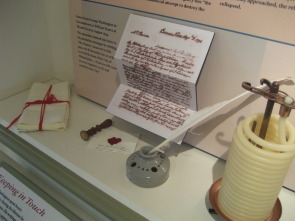 Morris family Papers, 1695-1965 (Collection 2000B), The Historical Society of Pennsylvania. PDF.